John Deere’s new X310 lawn tractor provides several new features for even more convenient operation, while maintaining the reliability and performance of the current X300 Select Series models. For an easier and more comfortable ride, power-assisted two-wheel steering is standard on this new machine. This leads to considerably less steering effort and a more enjoyable driving experience for the operator. The X310 is also now equipped with a hydraulic power lift to allow effortless adjustment and control of the rotary mower deck. For simple lifting and lowering of the deck and attachments, the operator has a convenient control button on the dashboard – no further tools or settings are necessary. Alongside these new features, the X310 offers the proven X300 Series lawn tractor specifications. The range provides a choice of five different machines, including the flagship X304 four-wheel steer and X305R rear discharge models, and the whole range has been redesigned for 2014 to present a fresh and modern appearance. With a choice of cutting widths ranging from 97cm (38in) on the X300 up to 122cm (48in) on the X320 model, the range is suitable for grass areas up to 8000m². The automatic transmission includes Twin Touch foot pedals and standard cruise control for easy operation. 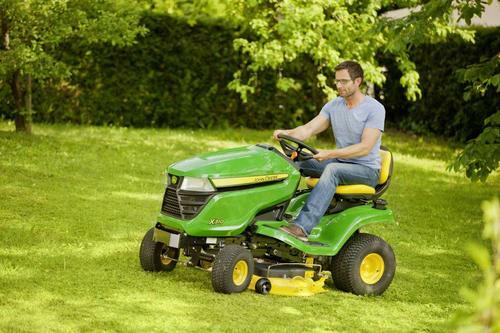 The new John Deere X310 and restyled X300 Series lawn tractors will be available at John Deere homeowner dealerships in spring 2014.